When neurologist Robert L. "Lee" Archer, MD, finished his residency in 1986, there were no disease modifying treatments for people with multiple sclerosis (MS). When the first treatment came out in 1994, demand was so great that a quarter million people with the disease wanted to be on the treatment, Betaferon. "There was a lottery to see who could start it first," Archer said. "That is the first and only time there has been a lottery to decide who starts a medication first. Everyone got on treatment within six months. Since then, there has been an incredible flurry of new drugs approved including ones just a couple months ago. Now we have about 15 drugs to choose from. It has become a well-defined specialty taking care of MS patients because it has gotten complicated about who should be on which drug. There is a lot of debate about which medication is best for which group of patients." Archer, a professor of neurology at the Jackson T. Stephens Spine and Neurosciences Institute at the University of Arkansas for Medical Sciences (UAMS), got interested in specializing in MS early in his career when he was contacted by the MS Society. "They knew I had taken care of several people with MS, and got good feedback from those patients," he said. "They asked me to consider making MS an area of expertise. I have done it ever since." Archer said it has been an easy choice to work with MS patients because they are so appreciative and typically have very supportive family members. "MS patients are invariably some of the nicest people you will ever meet," he said. "I always enjoy seeing them and trying to make their lives better. When I started, there was nothing we could give patients to stop the progression of the disease. Now it is just exciting we have so many options, even though we don't have a sure cure." A new drug, Lemtrada, came out a year ago that puts people in remission from MS about 65 percent of the time. But Archer said since it is a little more potent and more risky than a lot of the other medications, it is generally only used when other less potent medicines have failed. "Again, this is a challenging field," Archer said. "There is no easy cure." Archer grew up in El Dorado, got his undergraduate degree at the University of Arkansas Fayetteville, went to medical school at UAMS and has been there ever since. He initially planned to be a family care doctor, but got hooked on neurology when rotating through that specialty. "It seemed to have a nice combination of the intellectual challenge of taking care of people with difficult conditions, and on top of it the human aspects being compassionate for people with very serious illnesses. 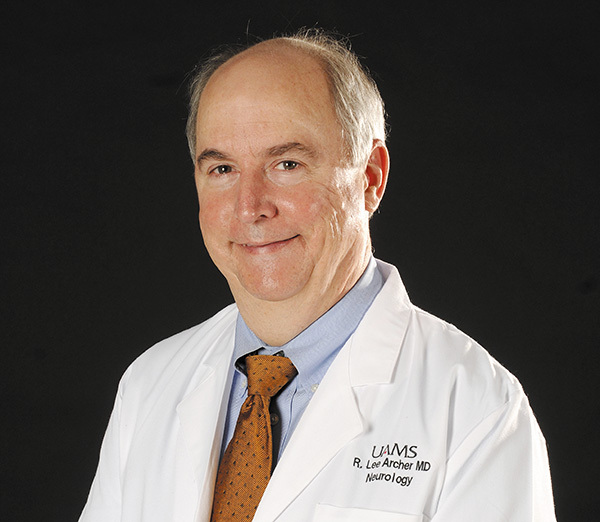 Dr. Dennis Lucy, the head of neurology program, was easy to work with and a great role model." A diagnosis of MS is very stressful for both patients and their spouses. Some studies have shown women are seven times more likely than men to be separated, divorced or abandoned after facing a serious illness. "It is very stressful," Archer said. "Those spouses who stay, I have a lot of admiration and appreciation for them. At the same time, those big life stresses often bring you closer. Your relationship can get even better if you can overcome those challenges." Physical therapy used to be the mainstay for helping people symptoms of MS. That has flipped. Now the big emphasis is trying to achieve perfect control with no spots on the MRI and no new symptoms. "The big challenge now is for someone who is not under control to get under the best control possible with the fewest side effects," Archer said. "We also give medicine for pain and fatigue. There are also cognitive issues. More than half of MS patients have a significant problem with depression at some point, in which case anti-depressants are prescribed. The mental issues are not just because of the challenges of the disease. Family members of patients with MS have an increased incidence of depression even if they are not dealing directly with that family member. There is something that is inherited along with the tendency for MS. We know there is physiological basis for that. The knowledge it is physiological has helped people to deal with it and not feel it is something shameful." Archer has very high patient satisfaction rankings. A quote he likes is, "Caring for the patients begins with caring about the patient." "And I think that is the key," Archer said. "If your mindset is you want to do the best you can, that is going to show in everything you do and say. You are going to make sure you don't leave the room until all the questions are answered." With only one specialist in the state, in the past Archer couldn't meet patient demand. But now Archer has a doctor helping him, Carolyn Mahaffey, who decided to specialize in MS because her sister has the disease. "We have room now to basically see anybody with MS who needs to come," Archer said. "That would be my number one shout out: The future is bright here with Carolyn Mahaffey coming in. Some people think because Dr. Mahaffey has joined me in treating MS that I'm retiring soon. But that is not the case. I plan to be here another ten years or so." Archer and his wife, Nancy, a retired school teacher, have been married 40 years. While they don't have biological children, they consider the children she taught and the residents he has taught to be their legacy. Archer has been on the Arkansas Regional Organ Recovery Board of Directors, and on the MS Society Leadership Council. He and his wife have organized mission trips to Honduras for about 12 years doing medical and construction work through Pulaski Heights United Methodist Church. MS around the Equator is 100 times more rare than in Arkansas. Virtually no one in Honduras has MS.
"We give out a lot of vitamins, parasite medicine, antibiotics, analgesics and reading glasses," Archer said. "It is a big deal for someone to get a pair of reading glasses that allows them to sew or read. The same thing is true for sunglasses. It is very rewarding. It is extremely fun. There is a good feeling of teamwork between us and the Hondurans who help organize the clinics."